The StarTech.com HDBaseT extender kit, extends HDMI up to 230 feet (70 Meters) over a single CAT5e or CAT6 cable. The extender supports Ultra HD and Full HD resolutions (4K / 1080p) with support for 3D and the accompanying digital audio. For added versatility, both the transmitter and receiver can be powered by the same single power source using Power Over Cable (POC). The versatility of this video extender makes it an ideal solution for digital signage applications in large buildings such as commercial shopping centers, stadiums, schools, and hospitals. What is HDBaseT? HDBaseT is a standardized, zero latency, video distribution technology that’s revolutionizing HDMI distribution. HDBaseT uses an advanced method of modulation that enables you to distribute uncompressed HDMI audio and video along with additional signals such as 100BaseT Ethernet, IR, RS-232 serial and power over cable. Extend more with HDBaseT The extender offers HDBaseT technology with HDMI and Power in a single extender kit, for complete end-to-end solution. Offering greater versatility than traditional HDMI extenders or HDMI cabling alone HDBaseT is the clear choice for every integrator and system designer. The added benefit of power over cable means you’ll only need one power source at either side of your extension, great for extending video to areas where power outlets may be limited, such as industrial sites. Astonishing 4K picture quality from an impressive distance With the A/V industry quickly adopting 4K as the new high-resolution video standard, long range video distribution can be a challenge with standard HDMI cables beginning signal degradation at 30 feet. With support for 4K you’ll be amazed at how HDBaseT maintains your Ultra HD picture quality, four times the resolution of high-definition 1080p, even at 130 feet away from your video source. 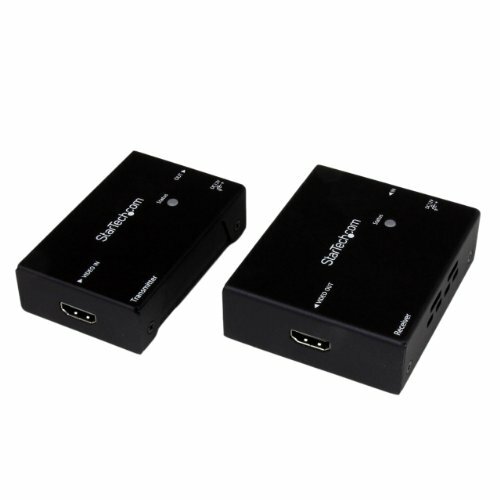 Plus, because the extender supports High-Definition 1080p and lower resolutions at 230 feet away, you can comfortably use this extender to make any video source look great. Simplify your setup This extender has been specially crafted for a smooth, tidy installation. HDBaseT technology allows for single cable installation, for seamless integration using existing CAT5e or CAT6 infrastructure, avoiding the hassle of running multiple Ethernet cables while, reducing potential failure points. Plus, the added benefit of power over cable means you’ll only need one power source to power both your extender and receiver, great for extending to areas where power outlets may be limited. Mounting hardware is also included for both the extender and receiver for discrete, professional mounting. The ST121HDBTE is backed by a 2-year StarTech.com warranty and free lifetime technical support.